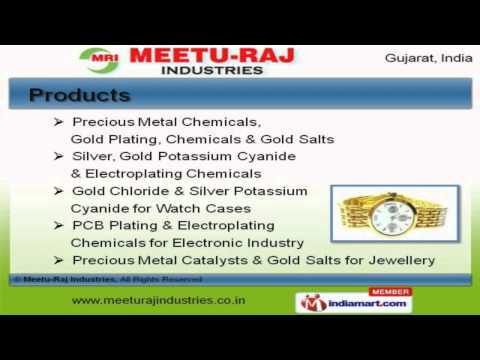 Welcome to Meetu Raj Industries, Manufacturer and Supplier of Precious Metal Chemicals. The company was established in 2006 at Rajkot. International quality standards and immense industry experience make us unique in the industry. Spacious warehousing facility and Market leading prices help us to serve Clients like Local Overseas, Molex India & BLG. We offer a huge gamut of Precious Metal Chemicals, Gold Chloride and Silver Potassium Cyanide for Watch Cases. Precious Metal Chemicals, Gold Plating, Chemicals and Gold Salts offered by us are extremely reliable. We are known in the industry as the manufacturer of Silver, Gold Potassium Cyanide and Electroplating Chemicals. We also provide Gold Chloride and Silver Potassium Cyanide for Watch Cases that are appreciated amongst our clients for superior quality. PCB Plating and Electroplating Chemicals for Electronic Industry are some of our best selling products. Along with that we offer PCB Plating and Electroplating Chemicals for Electronic Industry that are cost effective.